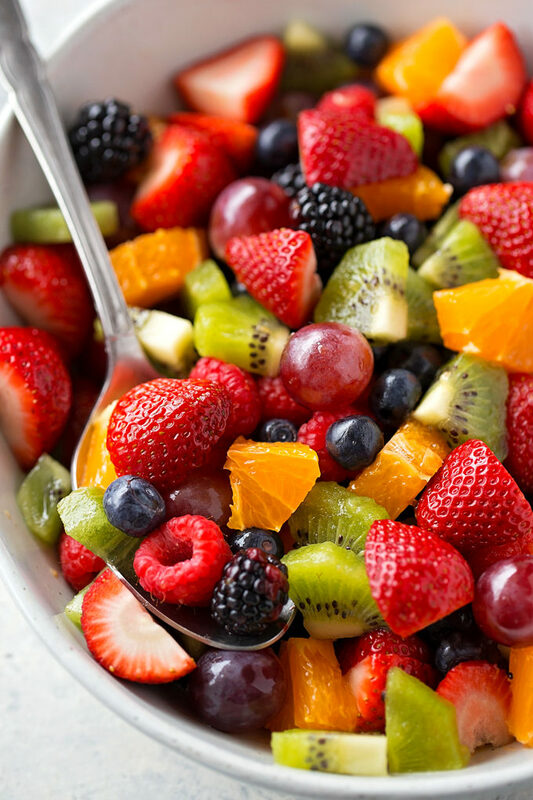 Learn how to make fruit salad the right way! This fresh, vibrant side dish is a spring and summer staple and can be prepped in under 15 minutes. I know, I know, this post seems crazy, right?! Cut fruit, toss fruit and boom, you’ve got fruit salad. That’s how I made fruit salad. That’s probably how most people make fruit salad. 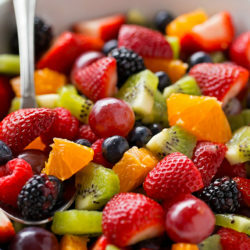 But if you want to know the secrets to making a really good fruit salad, read on! 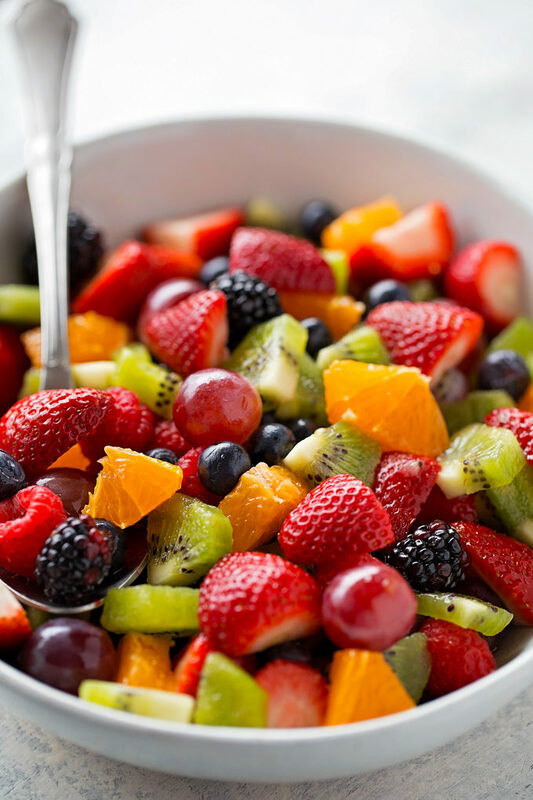 With Easter right around the corner and summer just a few months away, I wanted to share my tips and tricks to making a vibrant, fresh and flavorful fruit salad. There’s definitely more to fruit salad than just cutting up fruit and tossing it together. Duh (I promise I haven’t completely lost it)! Let’s talk about that last bullet point. THE FRUIT! That means NO bananas or apples especially if you aren’t eating it all right away. Like within 30 minutes max. No one wants a gooey brown banana. No one wants that ugly apple either. Save those for when you’re serving it to your family and you’re making just enough for that meal. Be careful when using raspberries, make sure they aren’t too ripe or they will fall apart as well. Cut your fruit so that it’s all relatively similar in size. Obviously blueberries are going to be small, but everything else should be more or less equal. Toss fruit it freshly squeezed citrus juice and zest instead of granulated sugar. Go with what makes sense. For example, in this particular salad I cut up oranges, so I used orange juice and zest to sweeten it. If you were doing an all berry fruit salad I’d suggest using lemon juice and zest. For a tropical salad (melons, pineapple, strawberries, mango etc.) use lime juice and zest. Garnish with fresh herbs or spices. Mint, poppy seeds, or a dash of chili powder (for tropical salads) make great additions. Totally optional though! I hope that was helpful! 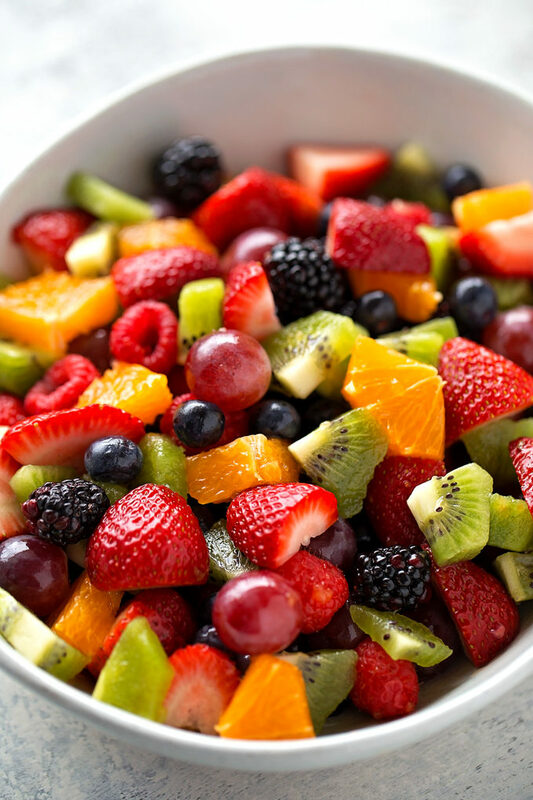 Let’s take our fruit salads from meh to mmmm! Leave a comment below with your favorite fruit salad combo, I’d love to know!! Toss fruit in a large bowl with the juice and zest. Let sit for 5 minutes before serving.